Half of Tuesday was spent in pursuit of a live pig. From the muddy outdoor market of Okai where walking through with a group that includes white Norwegians invokes a lot of whining especially when we came out empty handed. Accusations of being there to film etc. I’m still getting used to being called “blanc” since I’m a foreigner, being able to communicate in Haitian creole. We finally went to another town with more pigs. 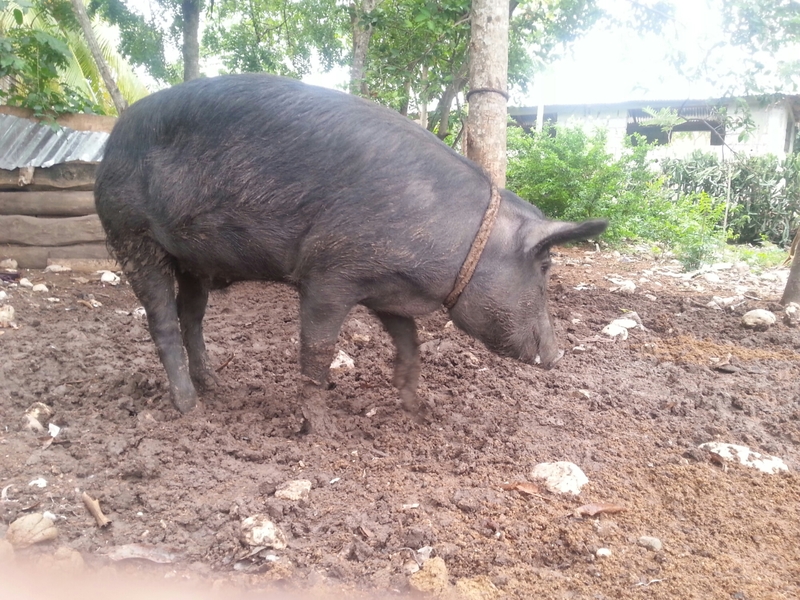 This involved a lot of negotiation s with Edwin, the co-founder of the org, who knew that as soon as they saw the foreigners that they would raise the price of a love pig. While we waited lots of schoolkids surrounded the truck and kind of stared until we tried to have a dialogue with the less ones. Kids in Haiti are apparently more reserved around outsiders especially in the smaller villages. But a girl and boy were more vocal and not parting ways. When I or Pedro, the Dominican in our group, came close the smaller children would start a slow dash. Maybe the fact that we were tall men with dreadlocks was the reason but it was humorous. Edwin finally got his pig and we brought it back to St. Louis. Something that should have taken less than an hour took up half the day. Welcome to Haitian time. When someone says they will be picking up at 9am expect that to mean closer to 11. This of course requires a lot of patient or multiple confirmations that you really need them to be there by the time you requested. Although i didn’t eat the pig, i did watch and film the pig being killed and it being grilled.